RONAN Curtis insists it was a ‘huge honour’ to represent his country as he goes into tonight’s derby clash with Finn Harps with his confidence through the roof after impressing with Noel King’s Republic of Ireland U21 squad this week. 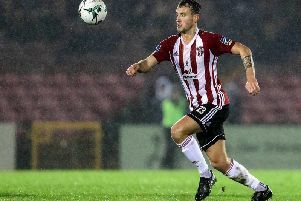 The Derry City forward played the full 90 minutes in both of the Republic’s UEFA U21 European Championship qualifiers against Norway and Israel as King’s side stretched their unbeaten run in the competition to four games to top the group. He went into the international double header on the back of scoring the decisive goal in City’s 2-1 win over Drogheda United at Maginn Park and continued that form with the Republic, as he was heavily involved in two of the four goals in the comprehensive win over Israel on Monday night at Tallaght Stadium. In fact, Curtis, who won his fourth international cap on Monday, could have got on the scoresheet himself against Group Five’s second highest seeds, Israel, when he bustled through two Israeli defenders on the edge of the area, but placed his effort wide of the left-hand post in the first half. Curtis went on to win the Republic a penalty when he was sent through on goal before being fouled by the out-stretched keeper. The referee pointed to the spot and QPR striker Reece Grego-Cox dispatched the penalty to make it 3-0. And in the second half Grego-Cox claimed his hat-trick when Curtis’ strike was parried into the path of the striker who tucked home the rebound for his hat-trick. Yes, big Chris (Coleman) is my Godfather but I wanted Ireland to win, no matter what. Hopefully one day I’ll be playing for the seniors and in a major tournament. Curtis certainly didn’t do his reputation any harm and the fact he was the League of Ireland’s sole representative in Noel King’s panel - although Burton Albion’s Ryan Delaney is currently on loan at Cork City - was a huge boost for the St Johnston lad. “Noel King is a very nice man, he’s a good manager,” said Curtis. “It’s good that he’s giving me a chance. e’s seen what I’ve done for Derry and has seen that I’ve played 20 or 30 games this season and have the knowledge and experience to play for his team,” added a delighted Curtis. It’s been a fine week for Derry City with three of the club’s senior players getting a call-up for their respective international panels and representing the Brandywell club with distinction. Ben Doherty earned his third cap with the N. Ireland U21s in their 4-2 win over Estonia in Mourneview Park while Eoin Toal scored his first international goal against the Germans for N. Ireland’s U19 squad. And Curtis is delighted Kenny Shiels’ side are getting the recognition they deserve. “It’s been a great week for the club. It’s great to see players getting a chance with the international teams. Myself with the Republic and being the only player from the League of Ireland in the team. But it’s not just me, there’s Ben (Doherty), Conor McDermott and Eoin (Toal) as well getting their chance with the N. Ireland teams. So it’s good to see that. Curtis watched former City winger, James McClean net that second half winner against the Welsh to keep alive Ireland’s hopes of reaching the 2018 World Cup Finals in Russia and while his Godfather, Chris Coleman was attempting to lead the Welsh to victory, the Derry City attacker insists there were no split loyalties on his part. He could well play his part in helping Ireland U21s reach the European Championships in Italy and San Marino in 2019 if King’s side maintain their impressive start to their Group Five campaign.Although with Germany poised dangerously behind them with two games in hand, Curtis knows there’s a long way to go. “One team goes through but we’re looking good at the moment,” he said. “If someone had told us we’d take 10 points out of four games you would’ve taken that no problem. We’re playing really well and I’ve gelled well with all the boys so everything is going really well. It’s back to the bread and butter of the League of Ireland tonight as City welcome Harps to Buncrana for a second time this season. And this is no ordinary derby clash with simply pride and bragging rights at stake as there’s plenty more riding on tonight’s result for both teams to add extra spice to the occasion. Curtis thrives on the big games and he’s ‘buzzing’ with anticipation going into tonight’s clash. “The boys are all excited for it and it should be a good game. I’m doing really well now again and I feel I’m back to my usual self. I’m looking sharp and feeling good so I’m looking forward to the game. “I’m feeling sharp at the minute, really good. I’m working hard in training and at the gym and I’ve come back from playing with Ireland and my confidence is high and I’m buzzing. So I’m looking forward to Friday night now. It should be a good test.